Mack Sennett (born Michael Sinnott; January 17, 1880 – November 5, 1960) was a Canadian-American film actor, director, and producer, and studio head, known as the King of Comedy. Born in Canada, he started in films in the Biograph company of New York, and later opened Keystone Studios in Edendale, California in 1912. 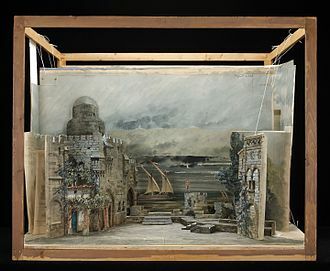 It was the first fully enclosed film stage, and Sennett became famous as the originator of slapstick routines such as pie-throwing and car-chases, as seen in the Keystone Cops films. He also produced short features that displayed his Bathing Beauties, many of whom went on to develop successful acting careers. Sennett's work in sound-movies was less successful and he was bankrupted in 1933. He was presented with an honorary Academy Award for his contribution to film comedy. Born Michael Sinnott in Richmond Ste-Bibiane Parish, Quebec, Canada, he was the son of Irish Catholic John Sinnott and Catherine Foy, married 1879 in Tingwick, Québec. The newlyweds moved the same year to Richmond, where John Sinnott was hired as a laborer. By 1883, when Michael's brother George was born, John Sinnott was working in Richmond as an innkeeper; he worked as an innkeeper for many years afterward. John Sinnott and Catherine Foy had all their children and raised their family in Richmond, then a small Eastern Townships village. 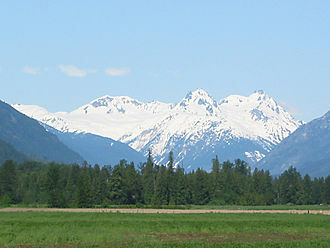 At that time, Michael's grandparents were living in Danville, Québec. Michael Sinnott moved to Connecticut when he was 17 years old. He lived for a while in Northampton, Massachusetts, where, according to his autobiography, Sennett first got the idea to become an opera singer after seeing a vaudeville show. 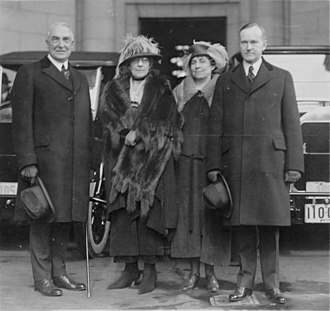 He claimed that the most respected lawyer in town, Northampton mayor (and future President of the United States) Calvin Coolidge, as well as Sennett's own mother, tried to talk him out of his musical ambitions. With financial backing from Adam Kessel and Charles O. Bauman of the New York Motion Picture Company, Michael "Mack" Sennett founded Keystone Studios in Edendale, California in 1912 (which is now a part of Echo Park). The original main building which was the first totally enclosed film stage and studio ever constructed, is still there today. Many important actors cemented their film careers with Sennett, including Marie Dressler, Mabel Normand, Charles Chaplin, Harry Langdon, Roscoe Arbuckle, Harold Lloyd, Raymond Griffith, Gloria Swanson, Ford Sterling, Andy Clyde, Chester Conklin, Polly Moran, Louise Fazenda, The Keystone Cops, Bing Crosby, and W. C. Fields. Mack Sennett's slapstick comedies were noted for their wild car chases and custard pie warfare, especially in the Keystone Cops series. Sennett's first female comedian was Mabel Normand, who became a major star under his direction and with whom he embarked on a tumultuous romantic relationship. 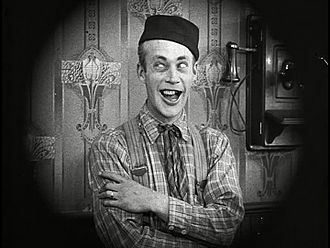 Sennett also developed the Kid Comedies, a forerunner of the Our Gang films, and in a short time, his name became synonymous with screen comedy which were called "flickers" at the time. In 1915, Keystone Studios became an autonomous production unit of the ambitious Triangle Film Corporation, as Sennett joined forces with D. W. Griffith and Thomas Ince, both powerful figures in the film industry. Also beginning in 1915, Sennett assembled a bevy of women known as the Sennett Bathing Beauties to appear in provocative bathing costumes in comedy short subjects, in promotional material, and in promotional events such as Venice Beach beauty contests. The Sennett Bathing Beauties continued to appear through 1928. In 1917, Sennett gave up the Keystone trademark and organized his own company, Mack Sennett Comedies Corporation. (Sennett's bosses retained the Keystone trademark and produced a cheap series of comedy shorts that were "Keystones" in name only: they were unsuccessful, and Sennett had no connection with them.) Sennett went on to produce more ambitious comedy short films and a few feature-length films. During the 1920s, his short subjects were in much demand, featuring stars such as Louise Fazenda, Billy Bevan, Andy Clyde, Harry Gribbon, Vernon Dent, Alice Day, Ralph Graves, Charlie Murray, and Harry Langdon. 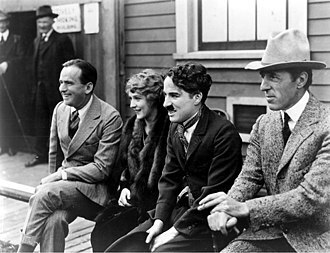 He produced several features with his brightest stars such as Ben Turpin and Mabel Normand. Many of Sennett's films of the early 1920s were inherited by Warner Bros. Studio. Warner Bros. merged with the original distributor, First National, and added music and commentary to several of these short subjects. Unfortunately, many of the films of this period were destroyed due to inadequate storage. As a result, many of Sennett's films from his most productive and creative period no longer exist. In the mid-1920s, Sennett moved to Pathé Exchange distribution. Pathé had a huge market share, but made bad corporate decisions, such as attempting to sell too many comedies at once (including those of Sennett's main competitor, Hal Roach). In 1927, Paramount and MGM, which were Hollywood's two top studios at the time, took note of the profits being made by smaller companies such as Pathé Exchange and Educational Pictures. So, Paramount and MGM decided to resume the production and distribution of short subjects. Hal Roach signed with MGM, but Mack Sennett remained with Pathé Exchange even during hard times, which were brought on by the competition. 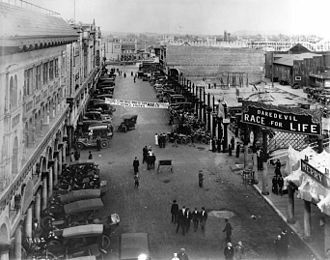 Hundreds of other independent exhibitors and movie houses of this period had switched from Pathe' to the new MGM or Paramount films and short subjects. Silent film Love, Speed and Thrills (1915) directed by Walter Wright and produced by Mack Sennett, running time: 14:12, is a chase film in which a man (named Walrus) kidnaps the wife of his benefactor, but the so-called "Keystone Cops" are also chasing down Walrus. Sennett made a reasonably smooth transition to sound films, releasing them through Earle Hammons's Educational Pictures. Sennett occasionally experimented with color. Plus, he was the first to get a talkie short subject on the market in 1928. In 1932, he was nominated for the Academy Award for Live Action Short Film in the comedy division for producing The Loud Mouth (with Matt McHugh, in the sports-heckler role later taken in Columbia Pictures remakes by Charley Chase and Shemp Howard). Sennett also won an Academy Award in the novelty division for his film Wrestling Swordfish also in 1932. 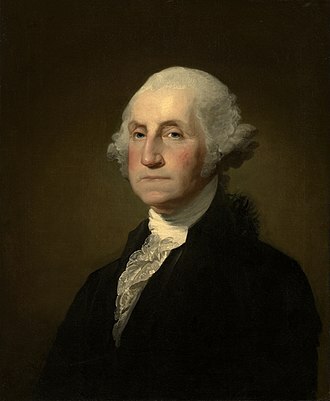 On March 25, 1932, he became a United States citizen. Sennett often clung to outmoded techniques, making his early-1930s films seem dated and quaint. This doomed his attempt to re-enter the feature-film market with Hypnotized (starring blackface comedians Moran and Mack, "The Two Black Crows"). However, Sennett enjoyed great success with short comedies starring Bing Crosby, which were more than likely instrumental in Sennett's product being picked up by a major studio, Paramount Pictures. W. C. Fields conceived and starred in four famous Sennett-Paramount comedies. 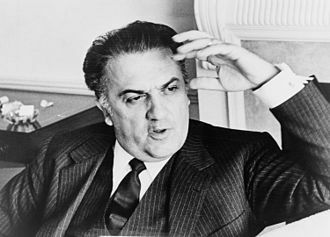 Fields himself recalled that he "made seven comedies for the Irishman", his original deal called for one film and an option for six more, but ultimately only four were made. Sennett's studio did not survive the Great Depression. His partnership with Paramount lasted only one year and he was forced into bankruptcy in November 1933. On January 12, 1934, Sennett was injured in an automobile accident that killed blackface performer Charles Mack in Mesa, Arizona. Mack Sennett went into semiretirement at the age of 55, having produced more than 1,000 silent films and several dozen talkies during a 25-year career. His studio property was purchased by Mascot Pictures (later part of Republic Pictures), and many of his former staffers found work at Columbia Pictures. In March 1938, Sennett was presented with an honorary Academy Award: "for his lasting contribution to the comedy technique of the screen, the basic principles of which are as important today as when they were first put into practice, the Academy presents a Special Award to that master of fun, discoverer of stars, sympathetic, kindly, understanding comedy genius - Mack Sennett." Rumors abounded that Sennett would be returning to film production (a 1938 publicity release indicated that he would be working with Stan Laurel of Laurel and Hardy), but apart from Sennett reissuing a couple of his Bing Crosby two-reelers to theaters, nothing happened. Sennett did appear in front of the camera, however, in Hollywood Cavalcade (1939), itself a thinly disguised version of the Mack Sennett-Mabel Normand romance. In 1949, he provided film footage for and also appeared in the first full-length comedy compilation called Down Memory Lane (1949), which was written and narrated by Steve Allen. Sennett was profiled in the television series This is Your Life in 1954. and made a cameo appearance (for $1,000) in Abbott and Costello Meet the Keystone Kops (1955). His last contribution worth noting was to the NBC radio program Biography in Sound relating memories of working with W.C. Fields, which was broadcast February 28, 1956. Mack Sennett died on November 5, 1960, in Woodland Hills, California, aged 80. He was interred in the Holy Cross Cemetery in Culver City, California. For his contribution to the motion picture industry, Sennett honored with a star on the Hollywood Walk of Fame at 6712 Hollywood Boulevard. He was also inducted into Canada's Walk of Fame in 2014. 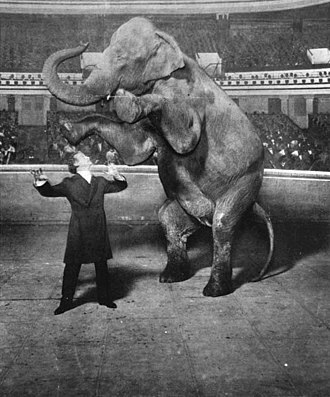 A line in a Henry Kuttner science-fiction short story "Piggy Bank" reads, "Within seconds the scene resembled a Mack Sennett pie-throwing comedy." In A Story of Water, a 1961 short film by Jean-Luc Godard and François Truffaut, the directors dedicate the film to Mack Sennett. Henry Mancini's score for the 1963 film The Pink Panther, the original entry in the series, contains a segment called "Shades of Sennett". It is played on a silent film era style "barrel house" piano, and accompanies a climactic scene in which the incompetent police detective Inspector Clouseau is involved in a multi-vehicle chase with the antagonists. In 1974, Michael Stewart and Jerry Herman wrote the musical Mack & Mabel, chronicling the romance between Sennett and Mabel Normand. Sennett also was a leading character in The Biograph Girl, a 1980 musical about the silent-film era. Peter Lovesey's 1983 novel Keystone is a whodunnit set in the Keystone Studios and involving (among others), Mack Sennett, Mabel Normand, Roscoe Arbuckle, and the Keystone Cops. Dan Aykroyd portrayed Mack Sennett in the 1992 movie Chaplin. Marisa Tomei played Mabel Normand and Robert Downey, Jr. starred as Charlie Chaplin. Joseph Beattie and Andrea Deck portrayed Mack Sennett and Mabel Normand, respectively, in episode eight of series two of ITV's Mr. Selfridge. ^ "Give Citizenship to Mack Sennett". Retrieved 2010-04-23. ^ "The Survival of Mack Sennett's Comedies – Flicker Alley". Retrieved 2019-01-21. ^ "Mack Sennett is Naturalized". The New York Times. March 26, 1932. ^ "Mack, Comedian, Killed In Crash. Moran, His Partner in Blackface Skits, Escapes Injury in Arizona Mishap". The New York Times. Associated Press. January 12, 1934. Retrieved 2015-03-22. ... injured Mack Sennett, former producer of 'Bathing Beauty' film comedies. ^ Thomas, Bob (1954). "Sennett Takes Sentimental Journey in Past at Reunion". Panama City News, March 12, 1954. Retrieved from Looking for Mabel Normand on 2012-02-03. ^ "Mack Sennett, 76, Film Pioneer Who Developed Slapstick, Dies. Keystone Kops, Custard Pies and Bathing Beauties Were Symbols of His Movies". The New York Times. November 6, 1960. ^ "Sennett Buried in Hollywood". The New York Times. November 24, 1960. ^ A Treasury of Great Science Fiction, vol. 2, Anthony Boucher (ed.) Doubleday & Co., 1959. Wikimedia Commons has media related to Mack Sennett. The Keystone Cops were fictional incompetent policemen, featured in silent film comedies in the early 20th century. The movies were produced by Mack Sennett for his Keystone Film Company between 1912 and 1917, the idea for the Keystone Cops came from Hank Mann, who played police chief Tehiezel in the first film before being replaced by Ford Sterling. Their first film was Hoffmeyers Legacy but their popularity stemmed from the 1913 short The Bangville Police starring Mabel Normand, as early as 1914, Sennet shifted the Keystone Cops from starring roles to background ensemble, in support of comedians like Charlie Chaplin and Fatty Arbuckle. John, and Wished on Mabel with Arbuckle and Normand, among others, comedian/actors Chester Conklin, Jimmy Finlayson, Ford Sterling and director Del Lord were Keystone Cops. In 2010, the previously lost short A Thief Catcher was rediscovered at a sale in Michigan. The short, filmed in 1914, stars Ford Sterling, Mack Swain, Edgar Kennedy, bag o Rags, the Keystone Kops unofficial theme music, was composed in 1912 by William Mac McKanless, an African-American orchestra leader and songwriter. 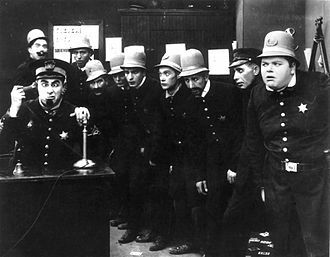 The original Keystone Cops numbered only seven, George Jeske, Bobby Dunn, Mack Riley, Charles Avery, Slim Summerville, Edgar Kennedy, Mack Sennett continued to use the Keystone Cops intermittently through the 1920s. By the time sound arrived, the Keystone Cops popularity had waned. This footage has been used countless times in productions purporting to use silent-era material, the Staub version of the Keystone Cops became a template for re-creations. 20th Century Foxs 1939 feature Hollywood Cavalcade had Buster Keaton in a Keystone chase scene, during his own silent film career, the nearest Keaton had appeared in a police comedy was The Goat and Cops. Abbott and Costello Meet the Keystone Kops included a lengthy chase scene, mel Brooks directed a car chase scene in the Keystone Cops style in his comedy film Silent Movie. By the 1950s surviving silent movie comedians could be pressed into service as Keystone Cops regardless of whether they appeared with the troupe authentically, in the This Is Your Life TV tribute to Mack Sennett, several Sennett alumni ran on stage dressed as Keystone Cops. Mabel Ethelreid Normand was an American silent film actress, screenwriter and producer. Onscreen, she appeared in 12 successful films with Charles Chaplin and 17 with Roscoe Fatty Arbuckle and she was not a suspect in either crime. Her film career declined, possibly due to scandals and a recurrence of tuberculosis in 1923, which led to a decline in her health, retirement from films. 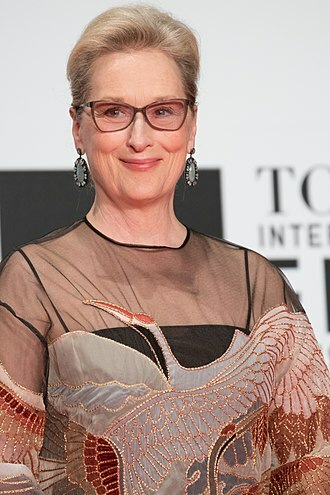 Born in New Brighton, Staten Island, New York, she grew up in a working-class family, Normands mother, Mary Minne Drury, of Providence, Rhode Island, was of Irish heritage, while her father was French Canadian. 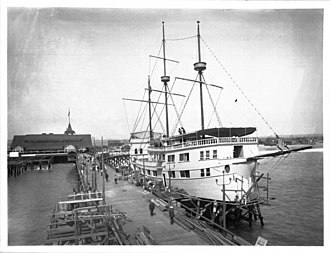 Her father Claude Normand was employed as a maker and stage carpenter at Sailors Snug Harbor home for elderly seamen. 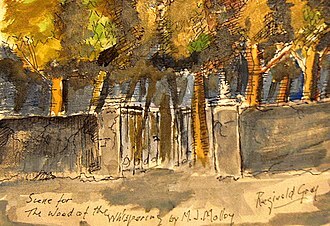 She embarked on a relationship with him, he brought her across to California when he founded Keystone Studios in 1912. Her earlier Keystone films portrayed her as a beauty but Normand quickly demonstrated a flair for comedy. Normand appeared with Charles Chaplin and Roscoe Fatty Arbuckle in many films as well as Oliver Hardy, Stan Laurel. She played a key role in starting Chaplins film career and acted as his lady and mentor in a string of films in 1914. 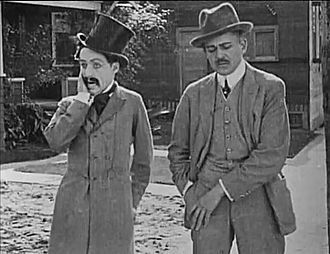 Chaplin had considerable initial difficulty adjusting to the demands of film acting, after his first film appearance in Making a Living, Sennett felt he had made a costly mistake. Most historians agree it was Normand who persuaded him to give Chaplin another chance, in 1914, she starred with Marie Dressler and Chaplin in Tillies Punctured Romance, the first feature-length comedy. She opened her own company in partnership with Mack Sennett 1916 and it was based in Culver City and was a subsidiary of the Triangle Film Corporation. She lost the company in 1918 when Triangle experienced a massive shake up which saw Sennett lose Keystone, in 1918, as her relationship with Sennett came to an end, Normand signed a $3,500 per week contract with Samuel Goldwyn. Director William Desmond Taylor shared her interest in books, and the two formed a close relationship, according to author Robert Giroux, Taylor was deeply in love with Normand, who had originally approached him for help in curing her cocaine dependency. Clowns are comic performers who employ slapstick or similar types of physical comedy, often in a mime style. Clowns have a tradition with significant variations in costume and performance. The most recognisable modern clown character is the Auguste or red clown type, with outlandish costumes featuring distinctive makeup, colourful wigs, exaggerated footwear and their entertainment style is generally designed to entertain large audiences, especially at a distance. Modern clowns are strongly associated with the tradition of the circus clown, many circus clowns have become well known and are a key circus act in their own right. The first mainstream clown role was portrayed by Joseph Grimaldi, the comedy that clowns perform is usually in the role of a fool whose everyday actions and tasks become extraordinary—and for whom the ridiculous, for a short while, becomes ordinary. This style of comedy has a history in many countries and cultures across the world. 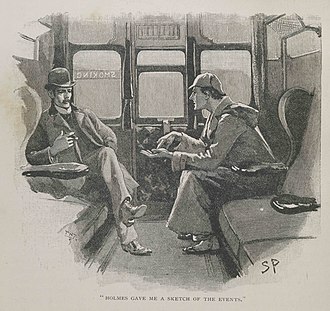 Some writers have argued that due to the use of such comedy. The fear of clowns, circus clowns in particular as a condition has become known by the term coulrophobia. Rustic buffoon characters in Classical Greek theater were known as sklêro-paiktês or deikeliktas, in Roman theater, a term for clown was fossor, literally digger, labourer. The English word clown is first recorded c.1560 in the generic meaning rustic, the origin of the word is uncertain, perhaps from a Scandinavian word cognate with clumsy. It is in this sense that Clown is used as the name of characters in Shakespeares Othello. The sense of clown as referring to a professional or habitual fool or jester develops soon after 1600, the harlequinade developed in England in the 17th century, inspired by the commedia dellarte. It was here that Clown came into use as the name of a stock character. Originally a foil for Harlequins slyness and adroit nature, Clown was a buffoon or bumpkin fool who resembled less a jester than a comical idiot and he was a lower class character dressed in tattered servants garb. Harry Philmore Langdon was an American comedian who appeared in vaudeville, silent films, and talkies. 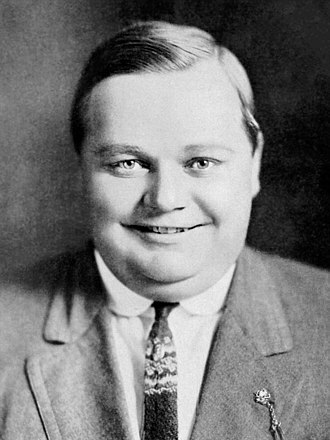 He was briefly partnered with Oliver Hardy, born in Council Bluffs, Langdon began working in medicine shows and stock companies while in his teens. In 1906, he entered vaudeville with his first wife, Rose Langdon, by 1915, he had developed a sketch named Johnnys New Car, on which he did variations in the years that followed. In 1923, he joined Principal Pictures Corporation, a company headed by producer Sol Lesser and he eventually went to Keystone Studios, where he became a major star. At the height of his career, he was considered one of the four best comics of the silent film era. 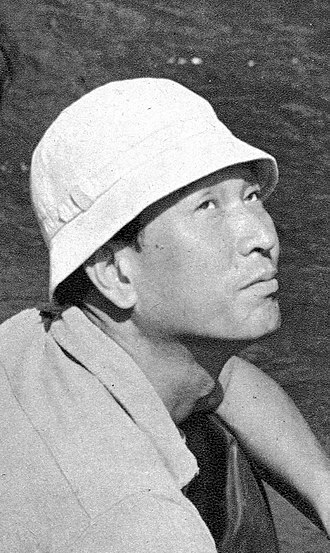 His screen character was that of a wide-eyed, childlike man with an understanding of the world. Most of Langdons 1920s work was produced at the famous Mack Sennett studio and his screen character was so unique and his antics so different from the broad Sennett slapstick that he soon had a following. Success led him into feature films, directed by Arthur Ripley, with such directors guiding him, Langdons work rivaled that of Charlie Chaplin, Harold Lloyd, and Buster Keaton. Many consider his best films to be The Strong Man, Tramp, Langdon acted as producer on these features, which were made for his own company, The Harry Langdon Corporation, and released by First National. After his initial success, he fired Frank Capra and directed his own films, including Threes a Crowd, The Chaser, and Heart Trouble and these films were more personal and idiosyncratic, and audiences of the period were not interested. Capra claimed that Langdons decline stemmed from the fact that, unlike the great silent comics. On the other hand, a look at Langdons filmography shows that Capra directed only two of Langdons 30 silent comedies. The coming of sound, and the changes in cinema, thwarted Langdons chances of evolving as a director. 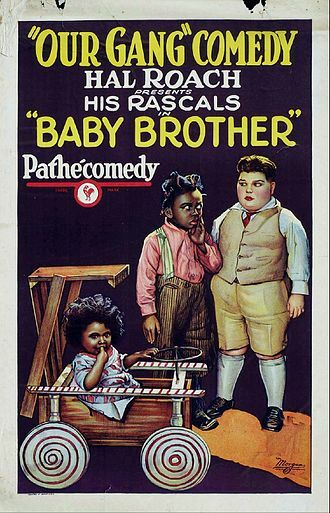 Langdons babyish character did not adapt well to films, as producer Hal Roach remarked. But Langdon was a big name to command leads in short subjects for Educational Pictures. In 1938, he adopted a Caspar Milquetoast-type, henpecked-husband character that served him well, Langdon continued to work steadily in low-budget features and shorts into the 1940s, playing mild-mannered goofs. 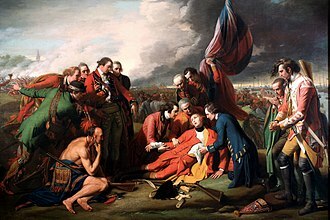 Richmond, population 3,275, is a town nestled amidst rolling farmlands on the Saint-François River between Sherbrooke and Drummondville, in the heart of Estrie in Quebec, Canada. 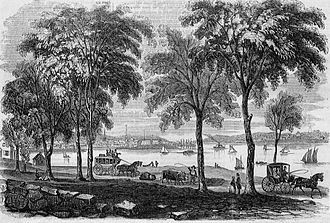 Richmond grew in importance during the 1800s when it became a key railway junction, the St. Lawrence and Atlantic Railroad opened between Montreal and Portland, Maine, on April 4,1853 and was purchased four months and absorbed into the Grand Trunk Railway s system. Two years later, the GTR opened a line from the mainline in Richmond northeast to Lévis to connect Montreal with Quebec City. The line was extended further east to Rivière-du-Loup and a connection with the Intercolonial Railway. The town itself was first called Richmond in 1820, when a post office was inaugurated, by the 1860s Richmond was an important centre, with a college, literary institute and a public library. Richmonds importance has waned since the 1930s, however, as the railways have come to play a role in the economy. The GTR was absorbed into the Canadian National Railways and the line to Levis was abandoned in favour of direct lines from Montreal to Quebec City. Thomas Harper Ince was an American silent film producer, director and actor. Ince was known as the Father of the Western and was responsible for making over 800 films and he revolutionized the motion picture industry by creating the first major Hollywood studio facility and invented movie production by introducing the assembly line system of filmmaking. He was the first mogul to build his own film studio dubbed Inceville in Palisades Highlands, Ince was instrumental in developing the role of the producer in motion pictures. Two of his films, The Italian, for which he wrote the screenplay, and Civilization and he partnered with D. W. Griffith and Mack Sennett to form the Triangle Motion Picture Company whose studios are the present-day site of Sony Pictures. He built a new studio about a mile from Triangle which is now the site of Culver Studios. Thomas Harper Ince was born on November 16,1880 in Newport, Rhode Island and his father was born in Wigan, England, in 1841, and was the youngest of nine boys who enlisted in the British Navy as a powder monkey. 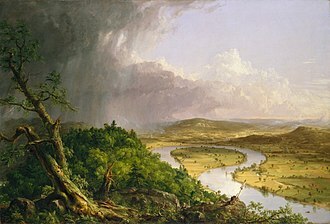 He disembarked at San Francisco, and found work as a reporter, around 1887, when Ince was about seven, the family moved to Manhattan to pursue theater work. Inces father worked as both an actor and musical agent and his mother, Ince himself, sister Bertha and brothers, Ince made his Broadway debut at 15 in a small role of a revival 1893 play, Shore Acres by James A. Herne. He appeared with several companies as a child and was an office boy for theatrical manager Daniel Frohman. Later he would form an unsuccessful Vaudeville company known as Thomas H. Ince and His Comedians in Atlantic Highlands, in 1907, Ince met actress Elinor Kershaw and they were married on October 19 of that year. They had three children, William T, richard Kershaw and Thomas H. Jr. Inces directing career began in 1910 through a chance encounter in New York City with an employee from his old acting troupe, William S. Hart. Ince found his first film work as an actor for the Biograph Company, directed by his future partner, Griffith was impressed enough with Ince to hire him as a Production coordinator at Biograph. Gloria May Josephine Swanson was an American actress and producer best known for her role as Norma Desmond, a reclusive silent film star, in the critically acclaimed 1950 film Sunset Boulevard. Swanson was a star in the silent film era as both an actress and an icon, especially under the direction of Cecil B. She starred in dozens of silent films and was nominated for the first Academy Award in the Best Actress category and she produced her own films, including Sadie Thompson and The Love of Sunya. In 1929, Swanson transitioned to talkies with The Trespasser, personal problems and changing tastes saw her popularity wane during the 1930s when she moved into theater, and television. Gloria May Josephine Swanson was born in a house in Chicago in 1899 to Adelaide and Joseph Theodore Swanson. Her father was from a strict Lutheran Swedish American family, and her mother was of German and Polish ancestry. 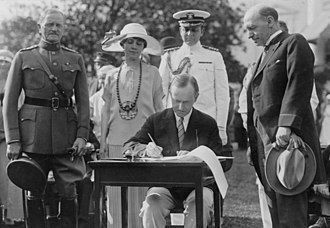 Because of her fathers attachment to the U. S. Army, the family moved frequently and Swanson ended up spending most of her childhood in Puerto Rico and she spent time in Key West, Florida. After a few months as a working with others like Charlie Chaplin. Her parents would soon separate and she and her mother moved to California, Swanson made her film debut in 1914 as an extra in The Song of Soul for Essanay. She reportedly asked to be in the movie just for fun, Essanay hired her to feature in several movies, including His New Job, directed by and starring Charlie Chaplin. Swanson auditioned for the female role in Swanson moved to California in 1916 to appear in Mack Sennetts Keystone comedies opposite Bobby Vernon. With their great chemistry, the pair became popular. Director Charley Chase recalled that she was frightened to death of Vernons dangerous stunts, conquering her fears, she often cooperated with Vernon. Surviving films in which appear together include The Danger Girl, The Sultans Wife. In 1919 she signed with Paramount Pictures and worked often with Cecil B. DeMille, who turned her into a lead in such films as Dont Change Your Husband and Female with the famous scene posing as the Lions Bride with a real lion. A slapstick scene from the 1915 Charlie Chaplin film His New Job. 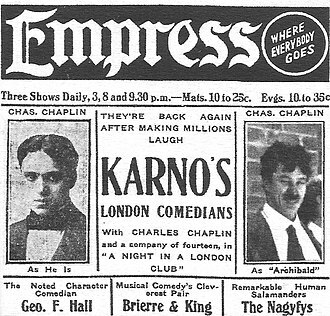 Chaplin started his film career as a physical comedian, and his later work continued to contain elements of slapstick. Les Rossyann. White clown and clumsy Auguste from France. 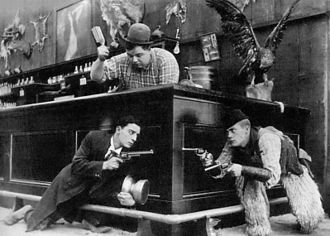 Arbuckle's nephew Al St. John (right) with Buster Keaton and Arbuckle in Out West (1918). 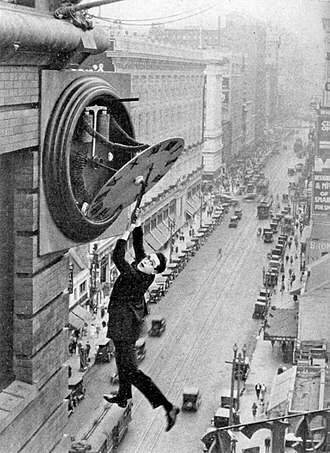 The iconic clock scene in Safety Last! Gloria Swanson in Teddy at the Throttle (1917). Gloria Swanson in a production still from the film, Don't Change Your Husband (1919). The gang races rich-kid Jerry Tucker in their makeshift fire engine in the 1934 short Hi'-Neighbor! 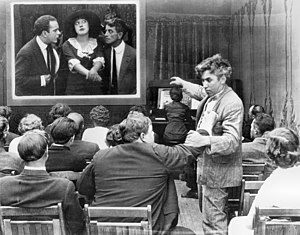 Left to right: Griffith, cameraman Billy Bitzer (behind Pathé camera), Dorothy Gish watching from behind Bitzer, Karl Brown keeping script, and Miriam Cooper in profile, in a production still for Intolerance (1916). The Keystone Cops in The Stolen Purse (1913). Pictured left to right are Robert Z. Leonard, Mack Sennett, Bill Haber, Henry Lehrman, — McAlley, Chester Franklin, Ford Sterling, Fred Mace and Arthur Tavares. The Keystone Cops in a typical pose in In the Clutches of the Gang (1914). The chief, using the telephone, is Ford Sterling. The policeman directly behind Sterling (extreme background, left) is Edgar Kennedy. The young cop to Kennedy's left is Robert Cox. The hefty policeman at extreme right is Roscoe "Fatty" Arbuckle. The young constable with bulging eyes, fourth from right, is Arbuckle's nephew Al St. John. The casting of the Keystone police force changed from one film to the next; many of the individual members were per diem actors who remain unidentifiable. Marie Dressler's crypt in the Great Mausoleum, Forest Lawn Glendale. The Mackenzie Bridge linking Richmond and Melbourne.